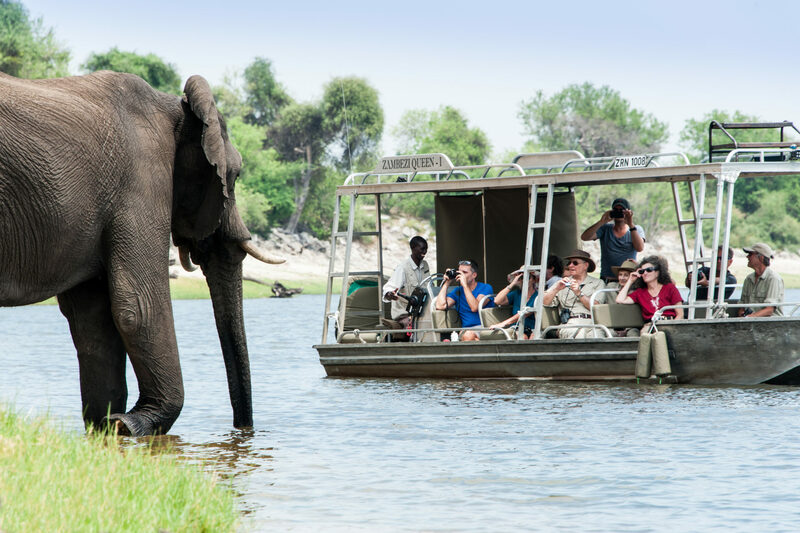 Photographing wildlife from a boat on the Chobe River is truly a magical experience. Take an African Days Wildlife Safari through spectacular southern Africa. In Namibia, you’ll travel through amazingly diverse environments, across the seemingly endless hot sands of the Kalahari and Namib Desert (home to some of the highest sand dunes in the world), down into the world’s deepest canyon, past rivers and ghost towns, through civilized cities and unspoiled African wilderness and alongside the unforgettable Skeleton Coast. Marvel at the teeming wildlife you encounter, including the oryx (gemsbuck), springbuck, ostrich, and zebra, to name a few. And better yet, elephants, giraffes, hippos, rhinos, lions and other wildlife you’ve only seen in zoos. Choose to be thrilled at the site of the ancient Victoria Falls in Zambia. Or get up close and personal with the flora and fauna in the wildlife preserves of Botswana. And let’s not forget the night sky over Africa, so dense with stars you’ll feel you’ve finally found a place untouched by time itself. Go ahead. Choose your trek. We promise you a trip you’ll never forget.